On the Customer Display Screen (CDS) versions 2.34 and newer, you can add customizable branding and promotional images to your customer-facing iPad at the point of sale. 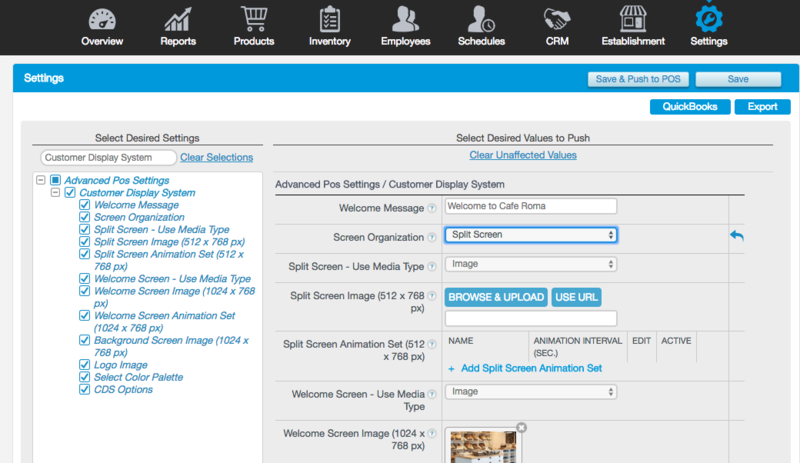 Settings for the Customer Display Screen must first be customized in the Management Console. The first setting you'll see is the Welcome Message box. When your CDS is idle, text entered in this field will appear on the center of your CDS screen. Next, select the dropdown for Screen Organization. If Split Screen is enabled, promotional images are displayed on the left side of the CDS screen and order details on the right. If Full Screen is enabled, the CDS will only display the order details. When finished, click Save. Split Screen - Use Media Type Select either Image(displays a single image) or Animation Set(displays a rotating set of images). Split Screen Animation Set If using an animation set, enter a set name, the number of seconds before rotating to the next image, and use the pencil icon to upload or enter an image URL. Welcome Screen - Use Media Type This settings controls whether you want a single image or a rotation of images to display on the CDS during an idle phase. Welcome Screen Image Upload a single welcome screen image here. Welcome Screen Animation Set Configure the timing and rotational set of images here. Logo Image Upload a logo that will be displayed on the upper left corner of the CDS. Select Color Palette Set the primary secondary colors for text on the CDS. The primary color is applied to buttons and text. The secondary color will apply to headers and footer bars on the CDS. CDS Options Configure the signature, tips, and receipt options of your CDS. Split Screen Mode: When an item is added to the Point of Sale, the desired images are displayed on the left, and order details on the right. 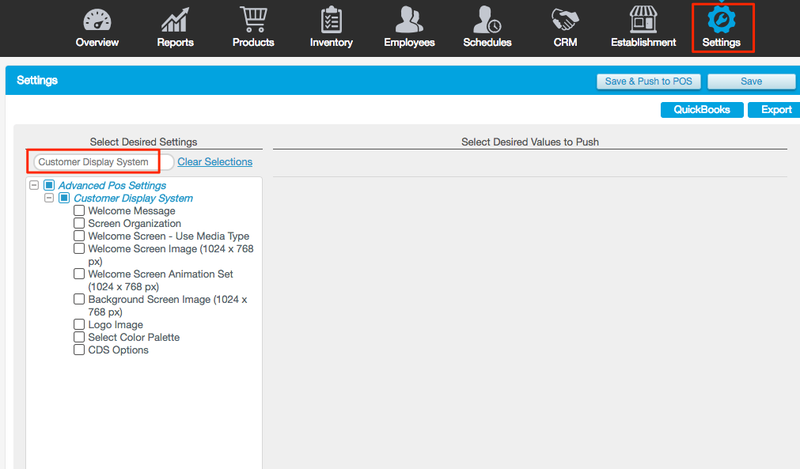 In the Management Console, go to the Settings tab. Click Clear Selections and type Customer Creation in the search bar. Check the box next to Allow Customer Creation on CDS so the actual setting appears on the right side. Once you check the box for the setting Allow Customer Creation on CDS, additional fields will appear.